Carriage bolts, DIN 603 - Valenta ZT s.r.o. 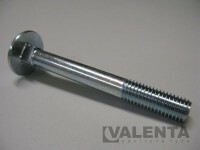 We stock a large number of carriage bolts with mushroom head. All these screws are zinc galvanized as corrosion protection.